Definition at line 14 of file UrlPort.h. Definition at line 25 of file Strategy.h. Definition at line 15 of file UrlPort.cc. References ACLData< M >::match(), AnyP::Uri::port(), ACLFilledChecklist::request, and HttpRequest::url. Definition at line 28 of file Strategy.h. Definition at line 32 of file Strategy.h. 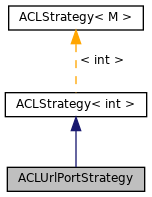 Reimplemented from ACLStrategy< int >. Definition at line 19 of file UrlPort.h. Definition at line 34 of file Strategy.h.